'The Minimalist' Mark Bittman was in St Louis last night to promote his new book, The Best Recipes in the World, another tome of 700+ pages like his bestselling and my oft-cooked-from How to Cook Everything. It was a small group of foodies gathered round, not a bite in sight, but I found him funny, cerebral and real, the kind of person you'd love to share a table with, even if he knew not one whit about food! While he signed my book, I mentioned making his Tomato Ginger Jam last summer using a bottle of chopped ginger -- to my surprise, he hadn't done this so I guess, yes, I really have "out-minimalized" the Very Minimalist himself! So tonight, straight from the pages of the new cookbook, is what Mark Bittman calls Vegetarian Tsimmes, an Eastern European vegetable and fruit stew that's pronounced like this. 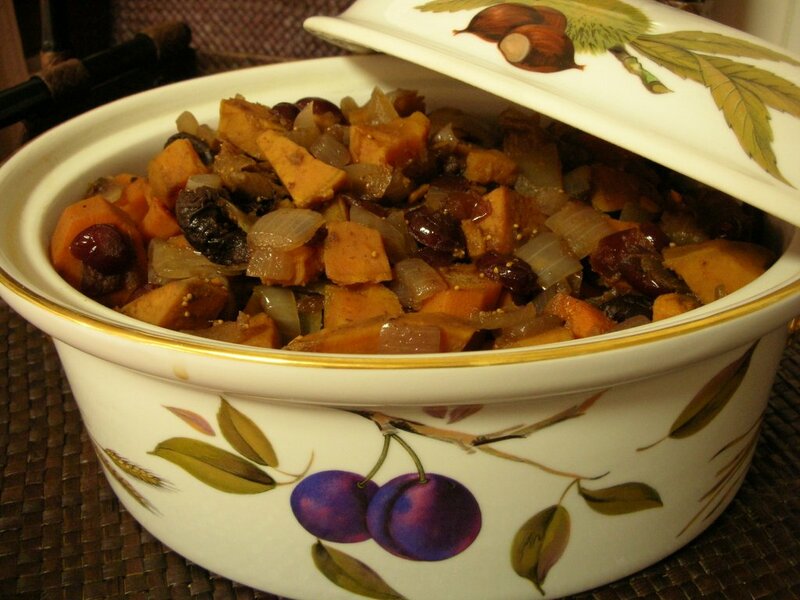 This version is sweet potatoes and carrots and dried fruit and ... prunes, because yes, this is Prune Blogging Thursday over at David Lebowitz. I figured on it being perfect for Thanksgiving tables. And it would be, yes. That said: It is sweet, in fact, sweet enough for the dessert table at a large potluck gathering -- I'm even tempted to mash some of the leftovers for a holiday pie. All in all, this was a grand introduction to Mark Bittman's new book -- and I do look forward to poring over and cooking from its many pages. And from the number of sticky notes already in place, I'd say that'll happen sooner than later. Preheat the oven to 325F. Scoop out 2 cups of the liquid and save. Drain the vegetables and return to the Dutch oven. Stir in the fruit (including the liquid), the remaining ingredients and about 1/2 cup of the potato/carrot liquid. (The recipe says a cup, this left an inch of liquid in the bottom.) Transfer to a well-buttered large casserole dish and top with dots of butter. Cover with foil and bake for 45 minutes (the recipe said 30 but that didn't seem enough, it also said to check occasionally and add more cooking liquid if the dish started to dry out, this didn't happen tonight). Remove foil and bake another 10 minutes to brown a little. Oh dear, now I know I really am channeling you. I just left a comment on Kitchen Parade saying that I had bought an immersion blender at Costco tonight (and you mentioned them in the soup recipe). Then I come here and find you talking about this cookbook, which I ALSO bought at Costco tonight! You know what they say about great minds thinking alike. I would have loved to have met Mark Bittman, and I had read about the cookbook on a couple of blogs. Looks great to me too. Thanks for the report, especially on the Q&A, which is often the most interesting part of author talks. "His [Mark Bittman's] take on the world's best cuisines: France, Italy, India, China and, the one he thinks might surprise, Mexico"
My guess is that he thinks that Mexico might surprise because most Americans (including me) have not seen the diversity and complexity of Mexican cuisine. My exposure is limited to cookbooks by Rick Bayless and Diana Kennedy, and Bayless' excellent PBS show, but even they reveal a wonderous variety not even hinted at by Mexican restaurants in the U.S. The reasons for this include the economics of the restaurant business, unadventurousness of U.S. palates, and the difficultly in obtaining Mexican ingredients in the U.S. Perhaps someday the restaurant scene will evolve to provide some Mexico's variety, but until then travel and cookbooks will be our connection to the true cuisine of Mexico.